While delayed for several months, Hanamonogatari, the latest tales from the sprawling Monogatari franchise, has finally aired in Japan. Sadly, this six-episode series lacks much of what makes the rest of the franchise so enjoyable—and may be the densest anime I have ever seen. One of the best things about the Monogatari franchise in general is its art style and direction. As I’ll get into more later, the vast majority of Hanamonogatari is two people standing around talking. It is difficult, no matter how you frame it, to keep something like that visually interesting. However, Hanamonogatari is always visually captivating as it turns all its backgrounds into surrealistic works of art. A popular train station is reimagined with bright colors and a disturbing lack of people, a messy bedroom is shown to contain nothing but red books (which are then set up outside as dominoes), and a basketball court is flooded with a thin layer of reflective water before the roof retracts to show the open sky. Frankly, there were times when watching Hanamonogatari that I became so lost in the backgrounds that I had to rewind a few minutes after I realized I had totally lost track of the conversation. In other words, this is an anime I wouldn't mind watching on mute. 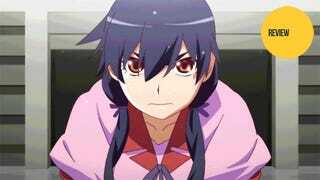 Suruga is one of the original girls from the first Monogatari series, Bakemonogatari. While all the other girls have tended to flow in and out of the overall narrative with some regularity since then, Suruga has been conspicuously absent—something all the more strange because of her familial relationship to one of the show's most enigmatic characters. So it’s about time that Suruga gets a follow-up story of her own. Perhaps the best part of Hanamonogatari (other than the art, of course) is the fact that the main characters of the series are largely absent—even the franchise's protagonist Araragi only shows up for two short scenes. Thus we get a supernatural story revolving around someone largely unconnected to the main group and get to see her confront the mysteries arrayed against her. Better still, none of the incredibly powerful characters ride in at the last moment to solve the problem for her. Instead, it is up to her to handle it all on her own. If I were to describe the structure of Hanamonogatari, I would say that it is “all talk and no action”—and this is just barely hyperbole. Of the hour and fifty-five minute runtime, I'd be surprised if even ten minutes of it aren't dialogue or internal monologue. Perhaps this would all be alright if the dialogue wasn't as painfully dense as it is—the conversations are nothing but philosophical arguments. The characters cover at length topics like the nature of good and evil, the internal battle between selfishness and selflessness, doing the right thing for the wrong reasons, how listening to other people’s woes can make you feel better about your own life, the purpose of wishes, and how worries affect how you view the world. These are all interesting topics and their points are well-made. However, when simply piled on top of one another without giving any time to digest the information, it feels like slogging through a jungle of ideas with no end in sight. Moreover, it's hard to pay such close, constant attention for so long without being distracted by something else—say the pretty backgrounds, for example. One of the greatest aspects of the Monogatari franchise as a whole is its wit. While the series has always been dialogue heavy, smart word play has always been one of the ways that it allows the viewer to decompress a bit. Absurdist humor and metacommentary are also used from time to time to much the same effect. Of course, none of that is present in Hanamonogatari. Perhaps a single scene in the entire show has anything more than a brief, one-sentence gag—and even the one-sentence gags are strikingly rare. Instead, it is nothing but philosophical dialogue from beginning to end. Truth be told, nothing much happens in Hanamonogatari—in fact, the plot can be summed up easily in a single (spoiler-filled) sentence. Yes, one major character-building event for Suruga takes place early on, but this is done to her passively and does little beyond creating more conversations to drive the rest of the anime. Really, all that Suruga does in the anime is talk, then move locations, and talk to someone else. Any sort of action beyond talking (or monologuing) is practically non-existent aside from two short basketball scenes—one of which serves as the climax. Hanamonogatari is definitely one of the weaker stories of the Monogatari franchise. While it follows a character with real potential to be interesting, it largely squanders said potential by telling a story filled with little beyond dense philosophical musings. Even worse is the almost complete lack of the series' trademark humor. That said, it is still beautiful to watch and fans will likely forgive anything just to get another helping of Monogatari's supernatural world—even if they walk away with a bit of a headache. Hanamonogatari aired on BS-11 in Japan. It can be watched for free and with English subtitles in the US on Daisuki.